It was a bad week to be an NFL coach making his debut on their new team. 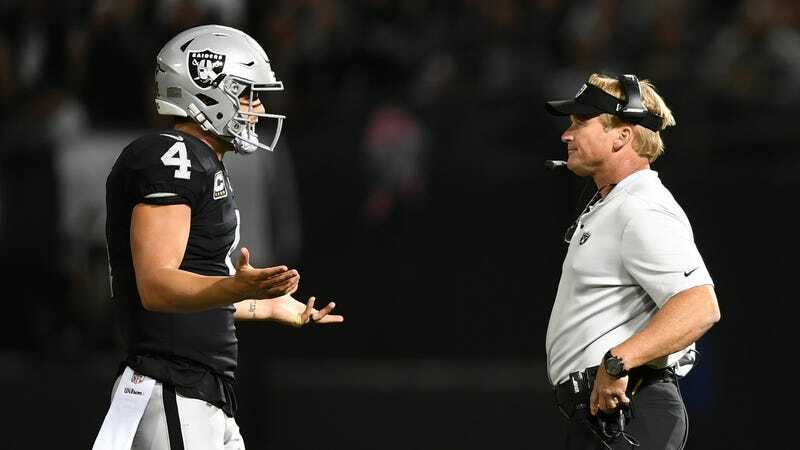 After Jon Gruden’s Raiders decided to allow the Rams to score 23 straight points on their way to a 33-13 loss, new coaches ended the first week of the regular season a combined 0-7, breaking a 17-year NFL record. Three of the coaches were lucky enough to make out with a close loss and room to grow. Pat Shurmur and the Giants survived against the Jaguars without too many scratches in a 20-15 loss, Mike Vrabel’s Titans lost a marathon of a game against the Dolphins, 27-20, and Matt Nagy only lost by one in a game most Chicago fans already chalked off as a loss—though it was at the cost of seeing Aaron Rodgers rip the hearts out of Bears fans across the country. The others weren’t so lucky and were on the wrong ends of double-digit losses ranging from mildly respectable—Frank Reich’s Colts—to downright humiliating—Matt Patricia’s Lions. In Steven Wilks’ case, the Cardinals’ performance was so bad it somehow resurrected the career of Adrian Peterson. Obviously, these front offices won’t be looking for immediate change, but it will at least be fun to see which fan bases will already start calling for heads to roll. The NFL is back!